In the fast-growing world of rugby professionalism it is particularly dangerous to ‘come on in the same old way’ from season to season, especially if that way happens to contain some fairly obvious weaknesses. Unfortunately this curse of repetition is exactly what seems to be bedevilling the 2017 Waratahs right now. Well over one year ago I wrote this article on the Highlanders’ formula for beating the Waratahs. There is a double dilemma here. There is the local question of the Tahs’ skill sets and systems keeping pace with those of their opponents, particularly those from New Zealand, but there is the larger issue looming in the background of Australia’s ability to match playing wits and show improvement within the terms of the current five-franchise structure. 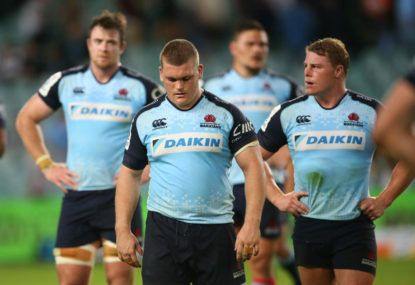 It is always a worry when your intellectual property shows no clear signs of moving on and developing, and the Waratahs, like all the other Australian sides, still seem stuck largely where they were in 2016. While some of the deficiencies – such as the lineout, with Dean Mumm now running a unit with four genuine receiving options – have been addressed, the major weakness in the team has not. That pressure point is a territorial game plan designed to keep the Tahs in their exit strategy, within their own last third of the field. 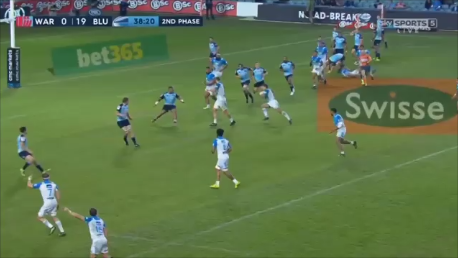 This is by far the weakest area of the Sky Blues’ game and it is crippling their chances of battling their top-tier Super Rugby rivals on even terms. The most troubling issues are an inability to stop opponents scoring points (an average 42 points conceded per game) and an identical margin of defeat whether the game is played home or away. Teams struggling with their win/loss ratio will typically start to build success by turning their home ground into a fortress, but that has not been the case for the Waratahs in Sydney. Far from it. The lack of starch when playing in front of their own people in Sydney must be especially galling for the Sky Blues’ faithful. On Saturday evening the Blues from Auckland cruised to a 26-0 half-time lead without really having to break into a sweat. That gave the Waratahs an insurmountable mountain to climb in the second period despite a gritty comeback. The Blues achieved their aim with a version of the Highlanders’ plan tailored to their own particular strengths. 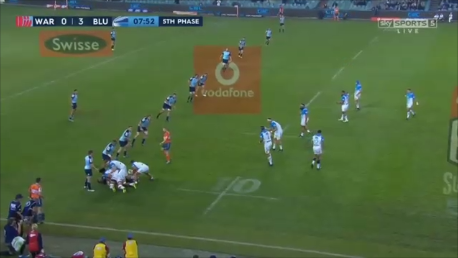 With the Tahs committing only 12 defenders to the line in the opening exchanges, the Blues began by establishing ball control in the middle of the field. Within the opening ten minutes of the game they had controlled it for two long sequences – 0:36-2:25 and 7:17-8:27 – totalling three minutes. 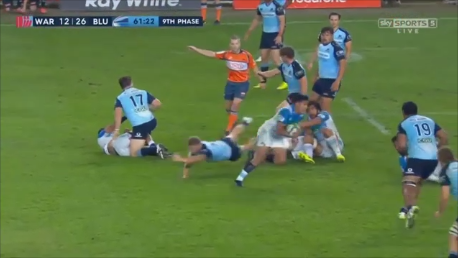 The Tahs are in a 12-man line and all eight Blues forwards are either buried in the ruck (three) or condensed on the near-side of midfield (five) – in all there are 11 Blues attackers playing on one side of the pitch. In the course of the first half the Blues were able to build 50 rucks and make 339 metres, seven offloads and five clean breaks out of this basic pattern – figures which are not too shabby as whole-game results, let alone the stats for one half of play! 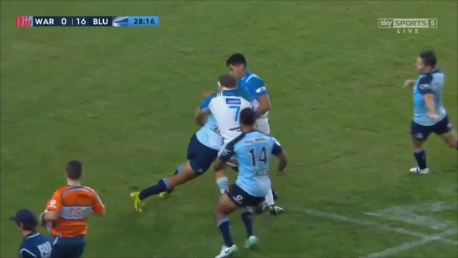 In the first example Latu was penalised, but in the second he was permitted to make the turnover – but who can really spot the difference in real time? 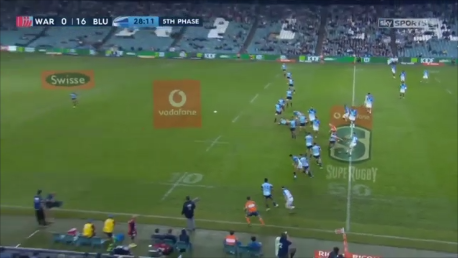 In these two frames a potential (three-on-two) is translated into an actual (two-on-one) attack on the gap outside Michael Hooper, with No. 5 Dave McDuling slow to close down the space from the second defender. 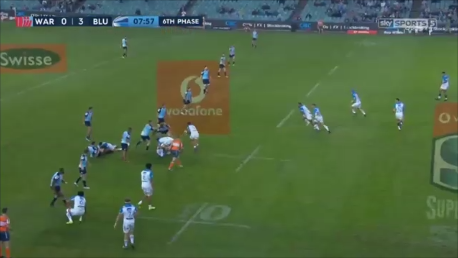 After a quick tapped penalty taken by half-back Augustine Pulu, on the following phase Piers Francis slides into a big hole between first defender Dean Mumm and the wrong-footed Latu outside him to set up an easy try for Scott Scrafton. Three tries or breaks all made through the same hole in the defence. 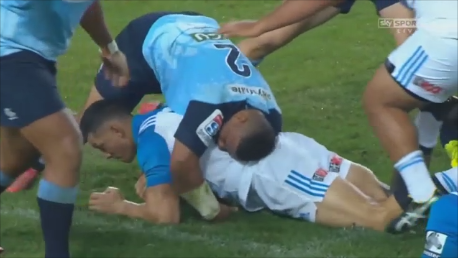 The same tries can be viewed in ‘live’ time on this highlight reel. 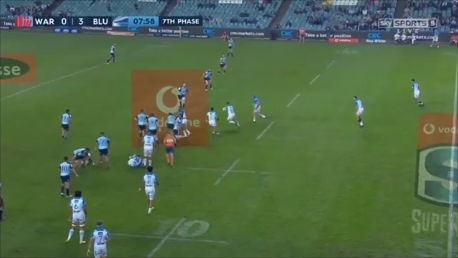 With the Blues controlling the ball so efficiently in that first half, the Tahs were forced to shift up another defender from the backfield into the front line, and this is where their exit strategy problems really came into focus in a big way. 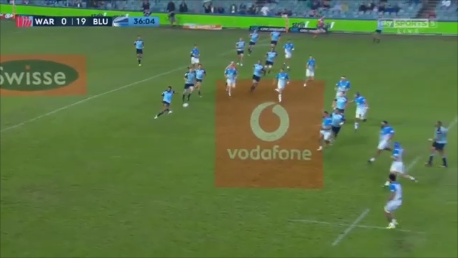 The diagonal kick from Francis finds Israel Folau having to cover the entire width of the field on his own, with two Blues chasers ready and waiting to collect him, isolated and without support on the return. 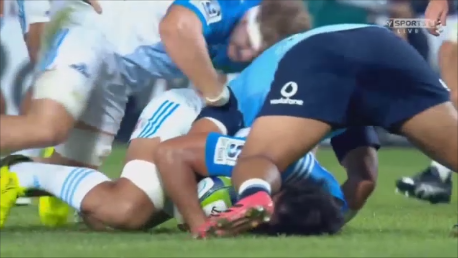 When the Tahs did try to exit from their own last third, their kicking attempts did not achieve the desired results. On six separate occasions in the first 45 minutes they failed to exit more than five metres beyond their own 22-metre line. 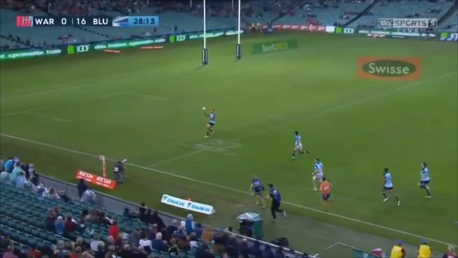 There were couple of short kicks from Bernard Foley, one from Israel Folau, and two from Waratahs’ #12 David Horwitz, the second of which flew a good eight metres over the touch-line, from well outside the 22 under no particular pressure from the Blues defence. 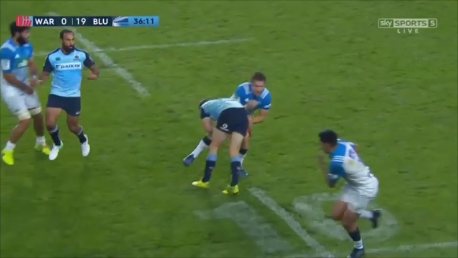 On the sixth occasion when the ball stayed infield, there was an evident lack of the same collective purpose demonstrated by the kick from Piers Francis and the two-man chase on Folau. When Reece Robinson goes to kick at 36:04, all but one of his team-mates are either on the wrong side of the ball or ahead of it and therefore out of play. One of the domino effects of the five-team structure in Australian Super Rugby is that lessons on the coaching and playing front are taking far too long to be absorbed. Is this more because of the lack of options in playing personnel, an absence of urgency in the improvement of individual skill sets, or coaching inflexibility? Whatever the answer to those questions, the outcome is straightforward. The Waratahs are getting ‘sent back in the same old way’ in 2017 as they were the year before, and the margins of defeat are becoming increasingly embarrassing to a team rich in Wallaby players – most especially at home and in front of their own people. The winning recipe is quite simple and easy for even the least successful Super Rugby team in New Zealand to follow. Keep the ball, exploit that looseness in the interior defence, kick for position when the Waratahs push another defender up into line. 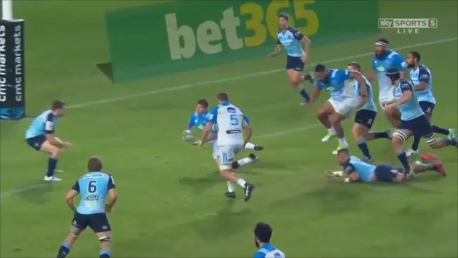 Above all, pressure the Tahs’ kicking game and force weak exits that can be exploited on the return or from deep-set attacking lineouts near the Sky Blue 22-metre line. The steady decline in standards is truly heartbreaking to any true lover or student of the game, and it is certain that Michael Cheika will find it very hard to right all the wrongs that are happening at the levels below him in the upcoming Wallabies training camp for June.